The 2017 ILYA Championship Regatta at Geneva is in the record books. Only sixteen A Scows registered for the event – we need to work hard to get our numbers back up! Next year the ILYA Championship Regatta will be at Minnetonka and we saw last June what a great venue that can be for us. Please make your plans now to support the A fleet and be sure to attend Nationals at Oshkosh (June 21-24, 2018) and the ILYA Championship in 2018. Special Thanks to our race committee and everyone at Geneva for the incredible job they did to host this event for the third year in a row. 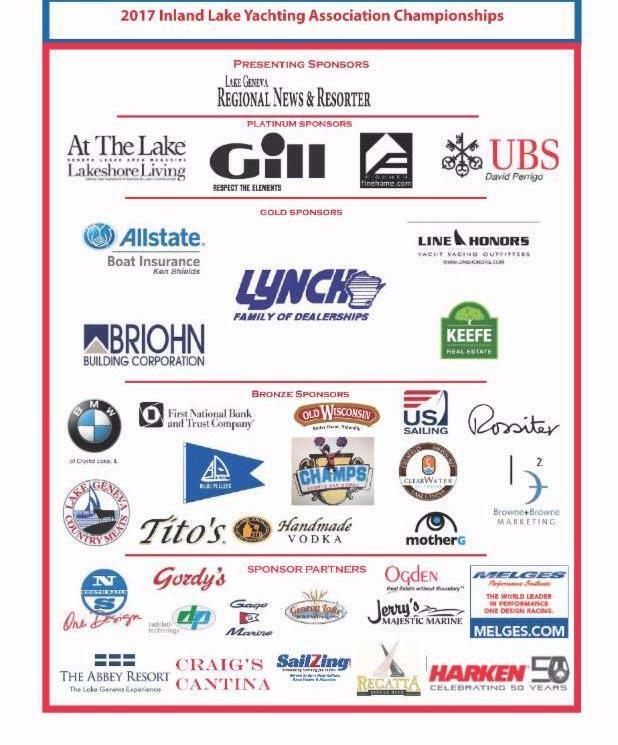 Please be sure to thank and patronize the many ILYA Sponsors and A Nationals Sponsors who made significant contributions to support our sailing this summer. Vincent Porter Wins the 2017 ILYA Championship! Vincent Porter (I-1) with team members Ryan Fitzgerald, Dave Navin, Kyle Navin, Junior Impens, Christian Spencer, and Greg Gifford won the event this year with just four points (1, 2, 1) in three races. The always tough Team Melvin (M-21) led by Pat Hughes took second, and MadCap (I-7) with T. Freytag at the helm finished third overall. Full results can be found online here. 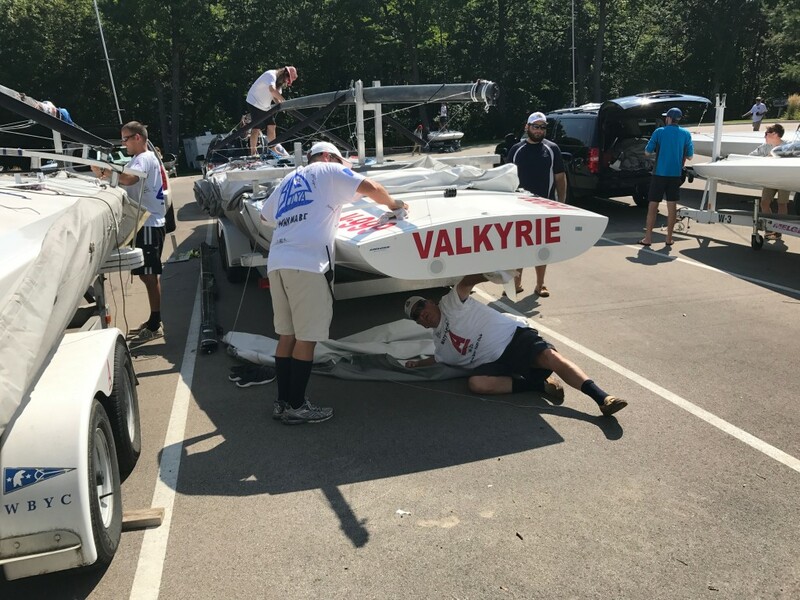 Not only did Vincent capture the A Scow crown, he also put together an incredible regatta in the E Scow and won that as well – great job Vincent! Unfortunately, weather was not on our side this year and perhaps the frustration carried over to the protest room. Scowlines characterized our racing as “beauty, competitive sailing and protests”. We should try to work on the third one. Our Wednesday evening races went from two to one when severe weather moved in and PRO Hodgson sent the fleet ashore after race one. Thursday afternoon’s breeze was over our limit of 25 mph, so again no racing. Friday morning the wind gods provided for us and we finally got two races back-to-back. Saturday morning there was zero wind and the lake was flat calm all day long, save for the incredible powerboat chop. Check out the August 17th Scowlines for some great A Scow photos of the event. NCASA Executive Director Todd Haines makes good use of Wannabe labor to get his boat ready. This is great news and should help us make the A Scow more appealing to a broader audience. Being limited to essentially one spinnaker “in the tube” means that as a class we should begin to consider whether it makes sense to move toward a future with only one spinnaker size (possibly something completely different than the array of sizes we now have). With any change like this we would have plenty of discussion and we would need to pick a date far enough into the future to allow for a smooth transition. This concept might be controversial to some owners, but could also be an important factor for future fleet growth since it would reduce costs significantly. Please take a moment to reach out to your NCASA Officers and Board Members – we would like to hear from you on this idea. Thanks to everyone who attended the ILYA Champs at Lake Geneva! We look forward to seeing all of you again soon. Sent to all NCASA members via email on August 22, 2017. If you missed it, join our email list here. Our 2018 A National Championship will be hosted by Oshkosh Yacht Club on Lake Winnebago with Thursday June 21, 2018 as the set-up and registration day and racing on June 22-24, 2018. In 2019 we plan to be at Mendota, then in 2020 its back to Green Lake. The A Nationals are always held the weekend after Fathers Day in June.